Here's my issue with crafting....I get bored. Easily. I'm always in love with my project when I begin, but by the time I'm halfway through, I'm ready to move on to something new. Enter Waldorf Dolls. I was introduced to these little gems by a post on a local The Mommies Network site (look them up in your area - seriously one of the best mommy networks around!) and I fell in love with them immediately. But, would making one stand up to my crafting ADHD? The answer, in a nutshell, YES!!! Each step provided a new challenge/skill to be conquered. I made two of these for my girls for Christmas and I enjoyed every last minute of them. 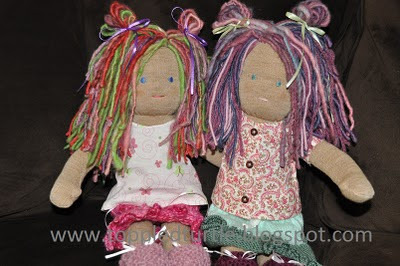 From forming/shaping the heads to sewing the bodies to hand painting and spinning yarn for the hair to knitting and sewing the clothes. I think I may have found my crafting true love! If you are at all inclined to try your hand at these, I highly recommend giving it a go! Now, down to the knitty-gritty of the how-to's. I found loads of tutorials online, so I'm not going to reinvent the wheel or add extra internet clutter by posting one of my own. But, I will help you navigate the tutorials I found and used. First off, for shaping the head I compared these two tutes: The flickr tutorial by toureasy47201 is easy to follow and written very clearly AND consisely (big bonus). I *highly* recommended readining through the entire toureasy47201 tutorial before reading any others. It gives you a really good idea of the overall project. When you are ready to read something more detailed/complex., the Silver Penny tutorial is loaded with details and walks you through everything nicely (even though the format it a little more difficult to read/follow and could be overwhelming if its the first doll tutorial you're trying to read). For head and body patterns: I liked the contoured shape at the end of the Silver Penny tutorial, but found it too small once printed, so I used that for a launching point and roughly enlarged in (eyeballed) and then fitted my enlarged fabric cutout around my formed head and trimmed until the shape was a good fit. For the body, I really like this pattern, but again, found it too small for my needs. I chose to make a 15-16 inch doll and although this pattern is for that same size, it seemed really scrawny to me, so I upsized for my needs. Consequently, there is a complete tutorial from which this pattern came located here if you are interested in reading up some more before starting. For sewing up/securing the head and arms to the body: I thought the flickr tutorial mentioned above was the easiest to follow - why complicate things if you don't have to, right?!?! For hair: I found only one that fit my needs published by Crafty Sheep. In case you get stuck with covering the back of the head, she clarifies her technique here. If you are interested in hand painting and spinning your own hair: well, let's just say that's a whole different topic. Stay tuned, I'll likely post about spinning since I'm enjoying this newfound fiber craft.